Now here’s a game changer in chain saws. Lightweight. Powerful. Easy to start. Quiet. With no mixing. No cords. And almost no sound. (Your neighbors will love this saw as much as you do.) And that’s just for starters. 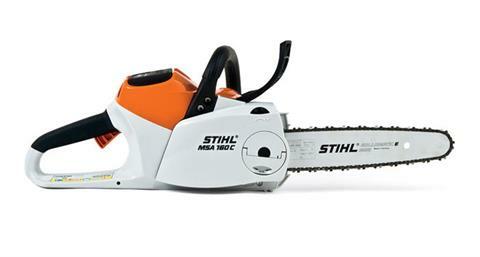 The STIHL® MSA 160 C-BQ is the first cordless chain saw tough enough to carry the name STIHL. 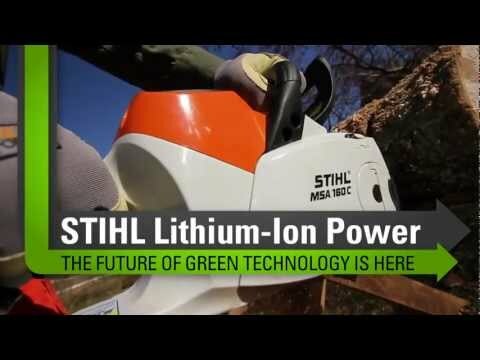 Powered by a STIHL lithium-ion battery, this little workhorse starts instantly, delivering 36V of power from its commercial-grade, high-torque brushless motor. Enough power to take on just about any cutting job in your yard. And the Quick Chain Adjuster (QCA) allows you to adjust the chain tension without tools for added convenience. Each charge of the AP 180 lithium-ion battery gives you up to 40 minutes of cutting time for storm cleanup, carpentry tasks and firewood cutting.